Despite the popular conception that plants are purifiers, plants have a detectable effect on particle or gas pollutants, according to the latest test data from real-world homes. The belief that plants are effective air purifiers is widespread. 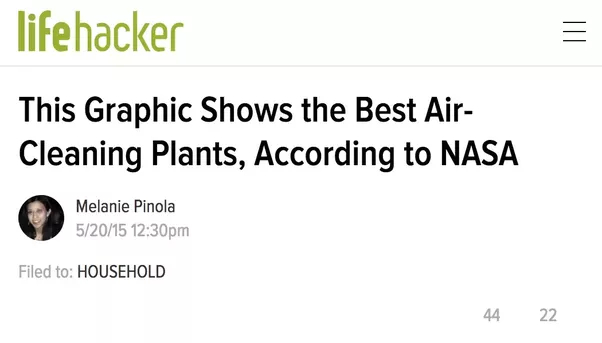 Arguably the most frequently cited evidence is the NASA study on plants. It feels scientific, authoritative. This page cites it, this page, this page. This entire Wikipedia entry is devoted to it. Let me claim some nerd cred. I read the original study–all of it. 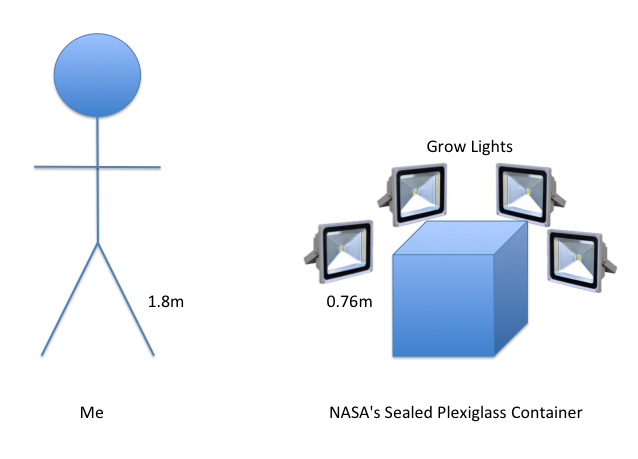 I found that the NASA study was done in small, completely sealed plexiglass containers surrounded by growing lights. For an idea of size, here’s what their setup looks like next to a stick figure version of myself. I’m not sure what your home is like, but that’s nothing like my home. In NASA’s defense, it’s a decent approximation of a spaceship. The NASA setup also has a key difference with our homes. They pumped in the chemical at the beginning, and then that was it. But in our homes, most sources of chemicals like formaldehyde constantly emit the chemicals. Is that effect large enough to actually matter in a real home? Is that effect enough to overcome a source that’s constantly emitting chemicals, which is the case when we have new furniture, new products, even some types of permapress clothes? Fortunately, some people have tested the effect of plants in real homes. I’ve seen some pretty fantastic claims about plants, like this TED speaker who said with a few plants, we could live in a sealed bottle. 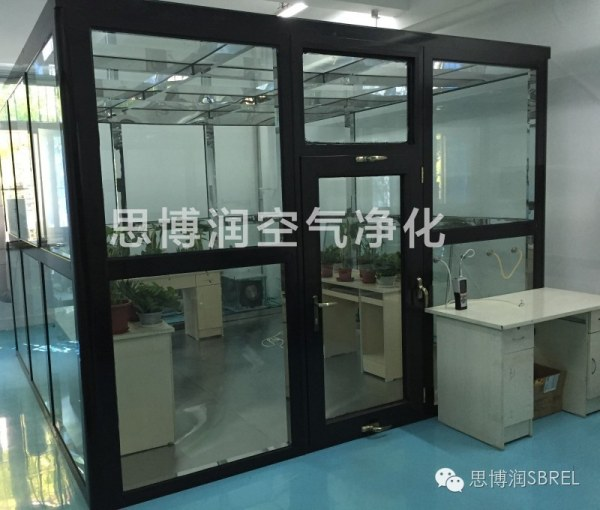 Fortunately, these guys in China tested whether plants can remove volatile organic compounds in a more realistic setup. It contains a constant source of VOCs (in this case, office desks). The experiment room is much larger than NASA’s box—more like a room in our homes. The room has no special growing lights (just like most people’s homes). They tested multiple times with an army of plants that people have specifically said reduce VOCs (such as the snake plant, aloe, and spider plant). And what happened? VOC levels actually increased from .17 ppm to .24 ppm during the tests. Even an army of plants wasn’t enough to deal with the gas pollutants coming from normal office furniture. Conclusion: This test suggests that the effect of these plants on VOCs is so small it’s not clearly detectable under normal conditions. Some plants actually emit VOCs, as can soil. 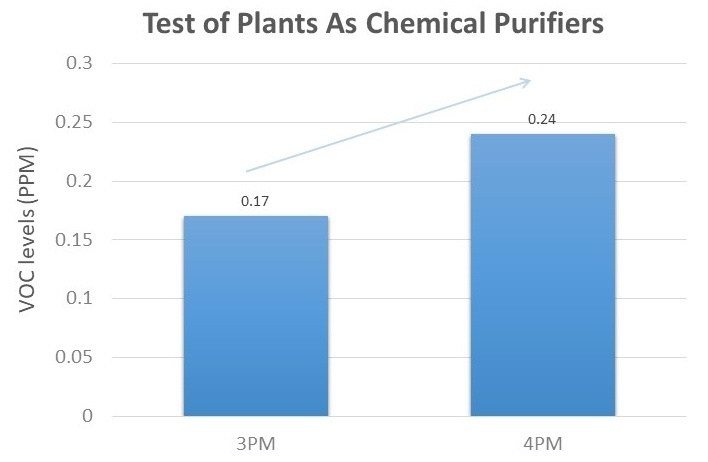 So it’s possible that VOCs went up because of the plants! The Chinese team claimed to be testing formaldehyde, but these detectors aren’t that specific. They detect VOCs (“VOC” is a big category, including lots of things from perfume, to alcohol, to chemicals like formaldehyde). So we have no idea which VOCs they’re detecting. That means it’s possible that these plants were decreasing a harmful VOC like benzene and increasing some non-harmful VOC. Did they use the wrong plants? There is some decent evidence that the effect on VOCs depends a lot on the type of plant. These researchers specifically chose plants that people claim are effective, but the results could be different with other plants. OK, so plants don’t seem very good at VOC gases. 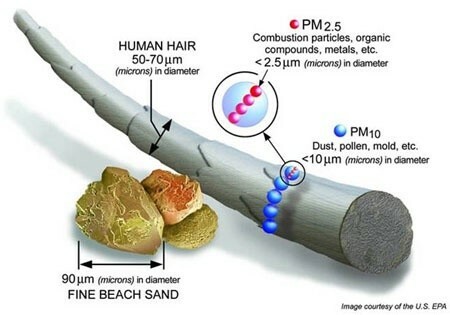 But what about tiny particles in our air, particulate pollution like PM2.5? 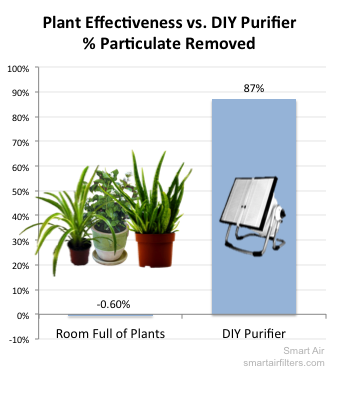 Here’s a comparison between plant effectiveness and a DIY purifier in that same room. Conclusion: These plants had no detectable effect on particulate pollution indoors. Is there NO evidence that plants help? I should say that some people claim to have found effects of plants in real-world conditions. For example, these researchers claim that 9 potted plants in a classroom in Portugal reduced particulate by 30% and VOCs by 73%! That stretches my imagination, at least. From the data I’ve seen, my conclusion is that there is not enough evidence to support the idea that plants meaningfully reduce VOCs or particulate in real-world conditions. At the same time, I think we need more real-world tests. Given the evidence that plants can remove some harmful VOCs in sealed chambers, I’d err on the side of putting plants in my home. It’s unlikely they’ll hurt, and there’s some possibility they’ll help with gas pollution. Plus, they are nice! P.S. 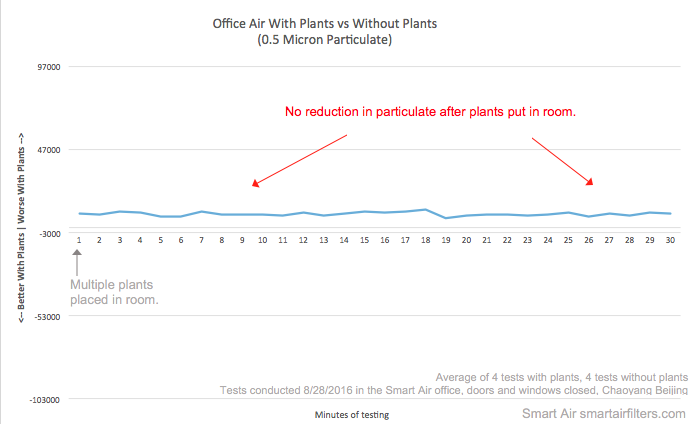 Another way of asking whether plants are effective purifiers is to look at several months of particulate pollution data in a room full of plants. I did exactly that in an apartment in Beijing. Here’s what I found.